This paper describes a case study of embedded librarianship at the James E. Brooks Library of Central Washington University (CWU). 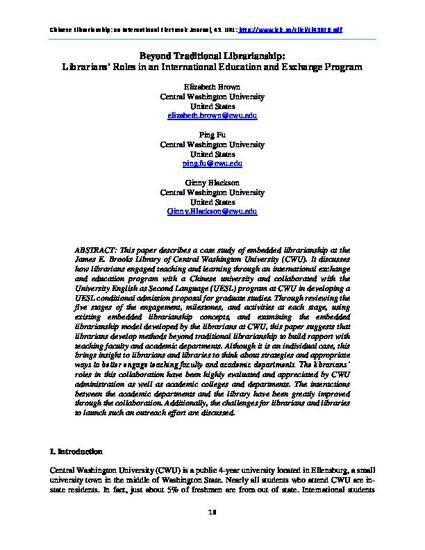 It discusses how librarians engaged teaching and learning through an international exchange and education program with a Chinese university and collaborated with the University English as Second Language (UESL) program at CWU in developing a UESL conditional admission proposal for graduate studies. Through reviewing the five stages of the engagement, milestones, and activities at each stage, using existing embedded librarianship concepts, and examining the embedded librarianship model developed by the librarians at CWU, this paper suggests that librarians develop methods beyond traditional librarianship to build rapport with teaching faculty and academic departments. Although it is an individual case, this brings insight to librarians and libraries to think about strategies and appropriate ways to better engage teaching faculty and academic departments. The librarians’ roles in this collaboration have been highly evaluated and appreciated by CWU administration as well as academic colleges and departments. The interactions between the academic departments and the library have been greatly improved through the collaboration. Additionally, the challenges for librarians and libraries to launch such an outreach effort are discussed.